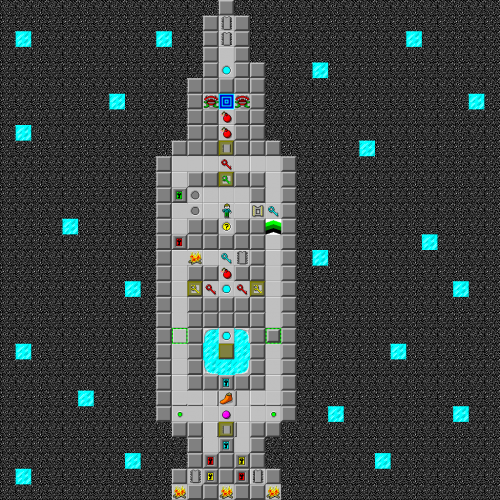 Sealed Doors in the Spacecraft - The Chip's Challenge Wiki - The Chip's Challenge Database that anyone can edit! Find a way through the sealed doors and gain control of your spacecraft. 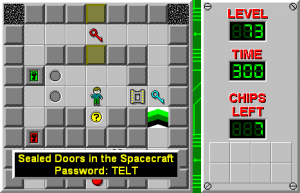 Sealed Doors in the Spacecraft is the 73rd level in Chip's Challenge Level Pack 4. It was created by Josh Lee. Under the Lynx ruleset, this level has a slight bust: because Chip cannot walk through an explosion, he is able to perform a partial post off of the bomb at (14,17) and reach the uppermost two chips using two blocks fewer than the intended solution.